Episode Review: CHUCK, "Chuck vs. the Living Dead"
The one thing Chuck does well is wrap up a season because tonight's "Living Dead" was by far one of the best episodes (I mean it this time), and I reminded me of how great the last handful of Season 2 episodes were. From the looks of it, Season 3 is going to end on a high-note like, if not higher than, Season 2. Ellie was still being manipulated by the Ring, and she convinced her father to come back, and Steve was confused why Casey and Sarah are still around since Chuck said he was no longer working for the C.I.A. Of course Chuck lied to his father so he wouldn't worry, which helped build the tension. One thing fans were hesitant about was Chuck changing, but we have to admit that he's a new person because he's able to lie to those around him, but he's still a likable character. Being able to walk that fine line is not easy, but Chuck (are more importantly Zachary Levi) is able to do it. Chuck's moments with his father were both effectively frustrating but also heartwarming. We know Chuck lied to his father so he wouldn't worry and to not disappoint the man that did so much to remove the Intersect from his brain the first time, so it was hard to watch those scenes. 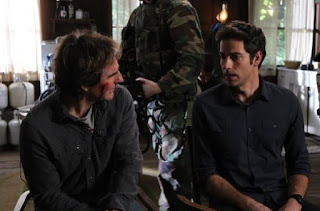 Fortunately, the show was smart enough to resolve their issues quickly and we got to see Steve approve of Chuck's decision to be a spy and vow that he'll do whatever he can to help him. Orion was also able to help answer some important questions about the Intersect 2.0, and helped the Ellie storyline along as well. I was not as annoyed by Ellie this week because I felt bad that she's totally being used by the Ring and she doesn't know any better. There was a moment where I wished they'd just kill her, but that was because it was so stressful watching her be manipulated like that. I'm still not sure if I like the idea of Ellie being brought into the fold at this point, but I guess it's a progression that has to be made. While Ellie's storyline has brought some well-timed tension, I'm ready for it to come to an end so we can move on. Other Odds and Ends: Great action tonight! The fight in Orion's cabin was one of the best of season. Again, I'm probably in the minority, but I'm kind of excited about Shaw's return. At least this time we know that we're supposed to hate him. The Buy More subplot was unnecessary, but it did have some funny moments. I'm starting to warm up to Morgan week in and week out. Who would've thunk it? "Living Dead" was a great kick-off to the end of Season 3, and I can't help but be pumped for next week's "Chuck vs. the Subway" and "Chuck vs. the Ring: Part 2". It's going to be awesome, and I can't wait for season 4! « Next Episodes: "Chuck vs. the Subway" and "Chuck vs. the Ring: Pt. II"